Check it out! Number and 1 and number 2 of my nanoSEWmo projects! 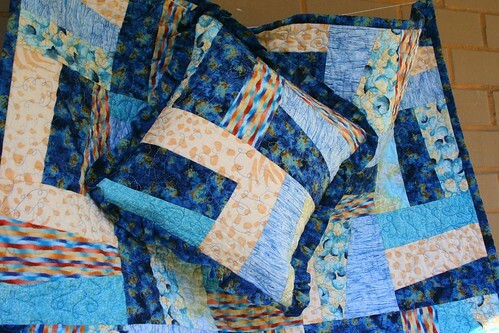 The pattern for this baby quilt and pillow is a Wonky Rail Fence, using the Stack-and-Whack method. The backing material is a solid light blue that I had on hand. 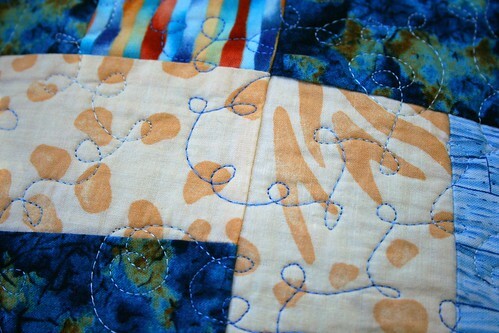 I also used a white/blue ombre rayon thread for quilting. It adds some extra sparkle to the quilt, I think. The pillow has a simple ruffle around the edge and an envelope style back. To be honest, I’ve had this quilt top on hand for a while waiting for the right time, the right baby and the right skill set. My free motion skills are definitely improving. It’s tough to keep your loop-de-loops even, let me tell you. But it is so worth the effort. The look on the Mommy-to-be’s face made it so. Congratulations Diana, Stephen & your little Rock Star Monkey! I can’t wait to meet him. Tagged baby, blue, cotton, free motion, gift, pillow, Quilt, rail fence, wonky. Based on your post, I tried loop-de-loops on my latest baby quilts. You’re right, that’s a really neat effect. Lately, I’ve been adding hearts, stars, and leaves to the basic loop-de-loop pattern. I think the stars have been the most successful! Ooooh! I’m just now moving beyond stipling, so it’s neat to see what other people are doing with their free-motion functions. Are you improvising or are you using a tutorial? Either way, I’m impressed. It’s improvisation. I can never manage to work myself beyond the basic free-motion instructions before getting board, so I’m self taught with that too. Lots of trial and error. If Lewis and Clark quilted, it would be a lot of trail and error.